TheMediagoon.com: Who should the Mets trade? Who should the Mets trade? It’s a different dynamic for guys like Wilmer Flores, Steven Matz and Zack Wheeler who can offer more team control; Flores and Wheeler will be eligible for free agency after 2019 and Matz after 2021. In these cases, the Mets can aim higher in their returns, though they also have to factor in: 1) Wheeler’s and Matz’s many health battles; and 2) whether they want Flores to keep blocking Dominic Smith and/or Peter Alonso at first base. A respectable return might present enough incentive to pull the trigger. They were talking in the Post if the Mets don't trade deGrom or Syndergaard that the players like Familia, Cabrera, Blevins, etc won't really get any real returns in the trades. I can see Flores getting a decent return nothing ground breaking but "something". I can also maybe shipping out Wheeler or Matz too and again getting something decent. Nothing blockbuster but something decent. 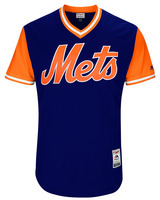 It is definitely time for the Mets to burn down this team and make the next move to making this into a real contender again.